A quick weekend trip to Lake Louise is nearly guaranteed to be an amazing way to enjoy winter. The Ski Hill is open; the winter hiking and sled trips are great. You might want to plan more than one weekend! Lake Louise is one of The Rockies most iconic images, but most photos of it are shot in summer. In winter Lake Louise is just as beautiful. It’s serene, frozen in a beautiful shell of pristine snow. A winter weekend holiday to Lake Louise doesn’t necessarily mean downhill skiing – of course the skiing is pretty great. 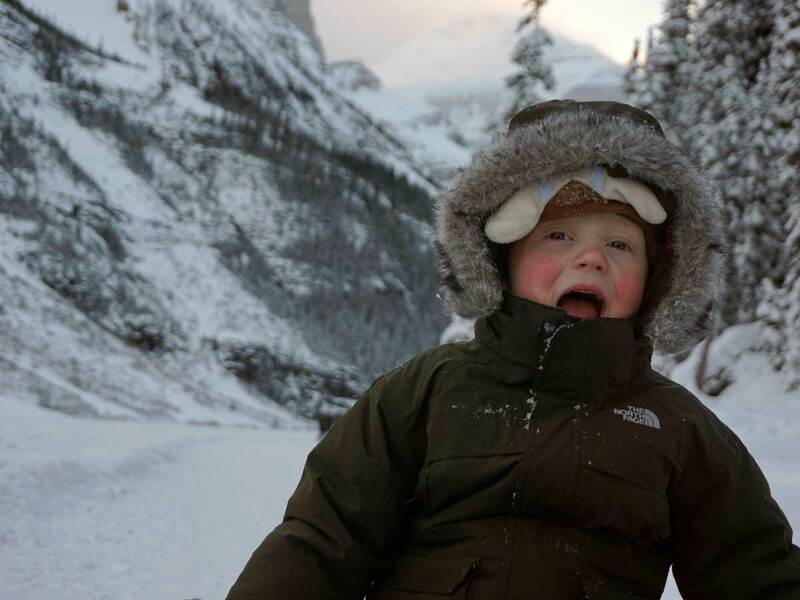 Winter is our favourite time in Lake Louise. With lower crowds come lower costs, and with incredible hotel and meal deals, especially midweek, it’s easier than ever to keep active over the winter. Insider tip: December and January are typically quite cold. If you can handle the cold you can expect cheap prices and no crowds. Just make sure to pack a parka, tuque, and mitts (jacket, beanie and gloves). Lake Louise is a small tourist village offering a small selection of very nice accommodation options. For more variety, head to nearby Banff, which has a vast amount of options to choose from – from budget friendly hostels to multi-family condominiums and luxury resorts. The crown jewel of Lake Louise is the Chateau Lake Louise. Built on the shores of the world famous shimmering Lake Louise in the late 1890s, this 4-star resort offers patrons a wide variety of amenities such as a fitness facility, full-service spa, a four-diamond restaurant, and much more. It’s built into a spectacular backdrop of towering mountain peaks and the grandiose Victoria Glacier, and has been a popular spot for luxury accommodation for more than 100 years. The views from the lakeside rooms are truly spectacular. Now, you might think that kind of luxury is out of your depth, but – if you sign up for our newsletter – we can get you 45% a night’s stay at the Lake Louise Fairmont Hotel! All you need is our free guide on Saving Money on a Winter Trip to Lake Louise, which – again – is available to subscribers of our newsletter. For a taste of European elegance in the Canadian Rockies, we recommend The Post Hotel. With an award-winning wine cellar, this was recently rated one of the World’s Most Beautiful Ski Lodges. Visitors can enjoy a full spa, including a salt-water pool, a variety of mountain lodge choices, various vacation packages, planned winter activities and more. 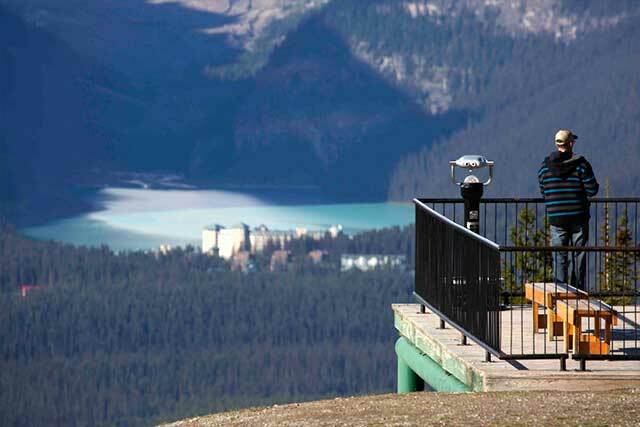 The Lake Louise Inn is a great budget-friendly hotel in Lake Louise Village. We love the condos and suites here. Having a group of people share a condo can be really fun and a great way to mediate costs. Just behind the Chateau Lake Louise, you’ll find the historic Deer Lodge. Dating back to the 1920s this beautifully restored lodge features rustic interiors and quaint, cozy rooms to stay in. Relax by the blazing fire at the end of a long ski day or sit in the rooftop Jacuzzi with epic views of the Victoria Glacier. 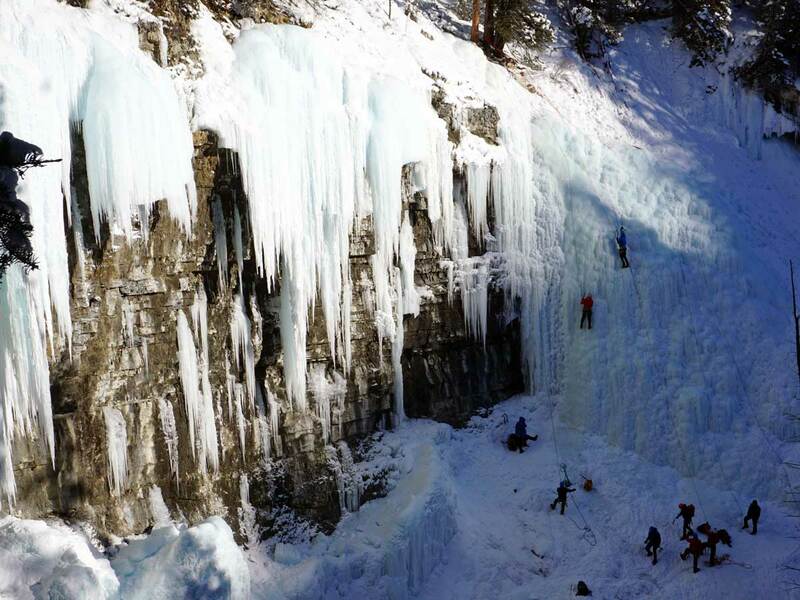 For those on a budget, make sure to check out the HI-Lake Louise Alpine Center.  This hostel is affordable, clean and sure to be full of an eclectic and interesting group of travellers. They have some great amenities, including ski storage. The alpine interiors fit seamlessly into the surrounding Rockies, and dorm rooms are simple and standard. It’s most likely the least expensive option in Lake Louise, but it’s certainly the best value. If you want more value for your ski trip, again, remember to sign up for our newsletter. With so many activities, a weekend in Lake Louise can please anyone in any age group. It’s great for families, couples, and friends. Being active in winter can be hard, but it sure isn’t a challenge here. You could just ski the whole time if you wanted – a lot of people do. But, if you want to see some natural beauty that you can’t see anywhere else you should try some new activities. You should embark on a winter adventure! Let’s start with skiing because it’s the most popular winter attraction for good reason. Near Lake Louise there are three ski resorts to chose from: Mt. Norquay, Sunshine and Lake Louise. All three resorts are impressive, however Lake Louise is most suitable for both expert skiers and learners as they have wonderful long magic carpets. Mt. Norquay is the closest to Banff, which is fun if you want to do a day trip there. Mt.Norquay also has great lessons and a fun tube park. Finally, Sunshine has the best snow of the three, and it offers the added bonus of staying on the hill. If you’ve never experienced staying on a hotel on the hill it really is something special. Those who’ve been to Lake Louise in summer know the hiking is world-class; however, many people assume you can’t hike in winter, but they’d be wrong! Most outdoor stores rent microspikes with mini-crampons that greatly improve your balance in snow and ice. Once you’re microspikes are on you’ll feel like you can tackle any hill (although you probably should still be careful). A great walk to do is on the shoreline trail on Lake Louise, where you travel almost to the end of the lake. This is also the perfect route to bring a sled. It’s a flat walk, and on the way back there is a hill near the Chateau Lake Louise to sled on. For cross-country skiers the area around Lake Louise is abundant with skiing options, as the snow stays soft and dry due to the cold temperatures. You can arrange rentals and lessons through your hotel concierge, or rent a tour from Banff Adventures. Finally, you can’t be in the mountains in winter without checking out a sled trip – with the option to be pulled by dogs or horses. Kingmik Dog Sled Tours operates in Lake Louise and trip duration ranges from 30 minutes to the entire day. You can also go for a traditional sleigh ride around Lake Louise with a pick-up directly in front of the Chateau. Brewster Adventures and Banff Trail Riders both offer great sleigh ride packages. This is a beautiful way to enjoy the season near Lake Louise. All you need is some warm cider and some warm flannel blankets! Take in a bird’s eye view of the majestic, crystalline scenery from the Lake Louise Gondola. It’s quite magical in winter. It’s like looking out at a snow globe except you’re the one in the glass container. Quite frankly, one weekend isn’t enough time in Lake Louise. Once you get a taste of the magic of the region, you’ll be sure to come back over and over again to enjoy the stunning scenery and abundance of exciting activities.